Finding the perfect stocking stuffers for everyone on your list can be tough. Below is a collection of eco-friendly and organic stocking stuffer ideas that will make it easy to find fun to stock stuffers to please everyone on your list. The Best Christmas stocking stuffers for the whole family! Give everyone in the family Christmas stocking stuffer filled with eco-friendly and organic stocking stuffer ideas like those found below! you will find more than bears in this cute collection of organic plush animals. For each purchased, another is donated to a child in need. Each posable doll fits into pockets or purses for fun on the run. 10 Little Dwarfs each in a different vibrantly-colored outfit. One set has beards while the other does not. Extra large, oversized punch balls measuring up to 18” in diameter when fully inflated. Made from thick, durable, eco-friendly latex that is resistant to popping and extra stretchy rubber bands for long-lasting, extra punchy fun! Crayon Rocks are an awesome coloring tool for young children. They are vibrantly colored and make beautifully textured artwork similar to oil pastels. I’ve provided a few options below. For more art supply options see The Best Art Supplies for Kids. These little tubes of eco-friendly modeling dough make the perfect stocking stuffer for little hands. The perfect stocking stuffer and travel toy for everyone! Even my husband and I love playing with these. These magnetic blocks are the perfect thing to have in the car, the diaper bag, the purse, or at the restaurant. Combine sets for even more fun! I have provided a few different styles and colors of these amazing blocks below. Dominoes appeal to young and old alike and are great for family play. This beautiful set is made of durable and renewable bamboo. There are dozens of ways to play for endless fun! Lip balm is a classic stocking stuffer. I love the round container that these come in and the quality of the ingredients used. If you have a baby in the house, mom may want a teething necklace in her stocking. If you have a child that chews on everything, give them a chewing necklace. If your looking for more baby toys see Eco-Friendly Baby Toys That Boost Development Naturally. The wax used in these lovely candles is produced from the oil of soybeans in a manner that is mindful of our environment. It is biodegradable and less toxic when compared to paraffin wax. Our oceans and environments are at risk due to plastic waste. Plastic straws can’t be recycled and it takes 500 years for a single straw to decompose. Every year more and more plastic straws end up in our oceans, threatening the lives of animals that call it home. Sea Turtles, for example, have existed for 100 million years, but now are struggling to survive. It’s possible that a world in which sea turtles can’t survive may soon become a world in which humans struggle to survive. Help save the planet by gifting portable reusable drinking straws to the whole family! Related: How to Make The Best Tasting Green Smoothie Ever! Ever find yourself needing to cover a bowl and not wanting to use plastic wrap? I’m sure your family has too. Reusable beeswax food storage wraps offer the perfect solution. Matka Bee’s wax food wraps are flexible, self-adhesive and reusable. They are made from organic cotton fabric, natural beeswax, tree resin and Jojoba oil, all naturally antibacterial and preservative ingredients that Help Food Last Longer, thereby, REDUCING FOOD WASTE. Why not give the gift of green to go? With more and more cities banning the use of plastic bags in supermarkets every day these are a useful gift for everyone. Reusable Shopping Bags – Throw these in your car, purse, or pocket to use on the go everywhere you shop. The integrated stuff pouch comes with a drawstring and attached carabiner that can easily hook onto your backpack, keychain, or belt loop. Washable and Reusable Produce Bags – Made from lightweight cotton muslin, these bags are a no-waste alternative to plastic when buying food from bulk-bins and produce markets. They are washable, durable and will fold up small in a bag or pocket ready for use when one needs them in the farmers market or grocery store. Cotton Mesh Produce Bags – This set of cotton mesh shopping is as easy to stuff into a stocking as they are to stuff into a purse. They are the perfect choice as a gift for friends and family. 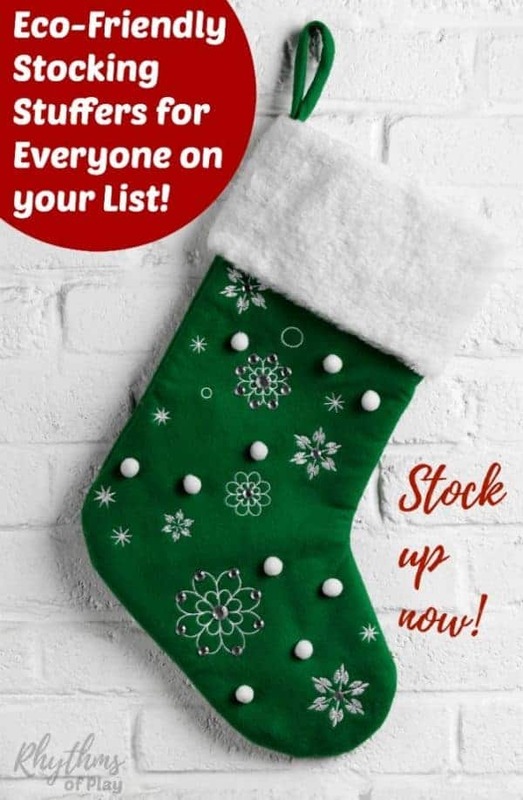 Want to fill the stocking with something green and useful? Stainless steel to-go travel bottles have been a family favorite in our home for years. The perfect alternative to plastic water bottles and paper coffee cups. Choose from insulated and non-insulated versions with several lid and color options. Looking for more eco-friendly toy options that would fit in a stocking? Many of the toys on our list of eco-friendly gift ideas for kids would be perfect. 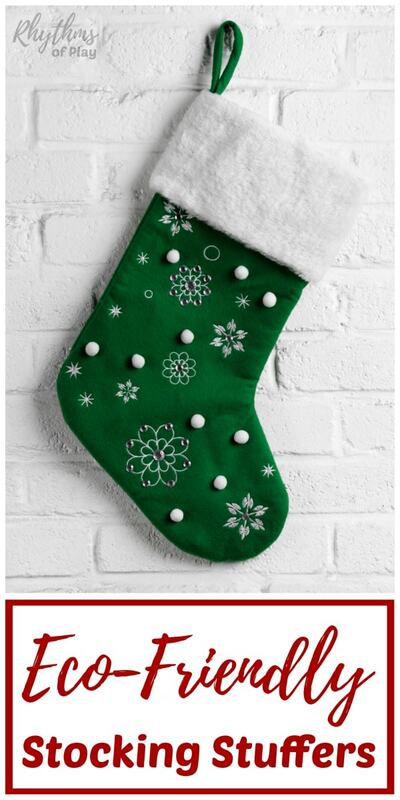 I hope this list of eco-friendly stocking stuffers for the whole family helps make your Christmas shopping a little easier. I’m sure you can find fun stocking stuffers on this list perfect for everyone on yours. Happy holidays! You may also like this collection of Christmas coloring and activity books for kids, teens, and adults! For more fun ideas check out 28 Fun Family Christmas Traditions for a Magical Holiday, and our Winter Bucket List Seasonal Activity Guide!